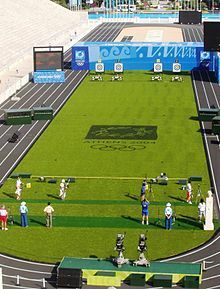 Archery competition at the Athens 2004 Summer Olympics. This sport was reintroduced in the Olympic program in 1972. ↑ At the time skateboarding was announced as part of the ২০২০ Summer Games, the sport was governed by the International Skateboarding Federation. That body merged with Fédération Internationale de Roller Sports in September ২০১৭ to form the current World Skate.